It seems as if I tend to open my blogs with an apology and once again I have to say sorry for the recent lack of posting. On a good note this is because George James Bridal has been busy and bustling with beautiful brides and although I do love to fill you in on all of my news my lovely ladies do of course take priority! With all of this in mind I thought as we have just celebrated the year anniversary of being in the fabulous new shop location on Bromham Road and with my own year wedding anniversary approaching this was the perfect time to do a very belated catch up. I can’t believe how much has happened in the last six months and I will do my very best to fill you in as far as possible. Forgive me for not going in to the finer details as the blog may very well then turn into a book so I will keep it short and sweet with the updates. The New Year started off with a flurry of wedding fairs which we always love to do as it is a fantastic opportunity to meet lots of lovely brides to be and also support wonderful wedding venues and catch up with industry suppliers. Whether your wedding is fast approaching or you are taking it slowly with the preparations then wedding exhibitions are a super way to get inspiration for the big day. In January we showcased our beautiful dresses at The Grand Hall and at The Sharnbrook Wedding Fair and then this was followed in February by the big three day event at Milton Keynes by Central Exhibitions where we also supplied dresses for the catwalk show and then the month ended with a triple whammy where the GJ Bridal team were out in full force at The Sculpture Gallery in Woburn, The Swan Hotel and Woodlands Manor. The Spring brought about The Wyboston Wedding Fair and then back to Milton Keynes for The MK Dons, moving swiftly into April we had a luxurious Twilight Show back at The Sharnbrook Hotel and later in the month the first Wedding Journey Festival took place at Moggerhanger swiftly followed by another fabulous Affinity Wedding Fair at The Swan and The Wedding Collective show at Bedford School. In May we ventured to St. Neots for the first time to take part in the Priory Wedding Fair and it has been lovely to welcome many more brides from the surrounding areas into the shop. The fairs tend to quieten down a little over the busy summer season but this part of the year was rounded off with another lovely Affinity Fair at Bedford Rugby Club and The Grand Hall opposite my beautiful boutique. I realise I have written quite a long list of all the shows but it is quite nice to give you an idea of all the lovely local venues that we attend so that if you are a bride to be and fancy popping by in the future then you can keep your eyes peeled for some of these fairs that will also take place in the Autumn and again next year. Always feel free to give us a call if you would like any more detailed information on upcoming events. Before I move on to more news I must do a very special thank you to my family who represent the magnificent GJ Bridal team. My parents, sisters, beautiful niece Amy who has modelled for me twice and my husband all help at all the events and I couldn’t do it without you all. The start of the new year also marked our two year anniversary. We are now moving swiftly towards the three year mark but wow what an incredible time it has been. The shop has expanded and more and more gorgeous gowns have been chosen. Over 400 weddings have taken or will be taking place and I am always in utter awe that I get to be involved in a small way towards all of these amazing days. I always like to tell my brides how honoured I am but when I receive the stunning pictures and thank you cards it really does mean the absolute world. I will eventually post all of the incredible pictures on the real brides page and Facebook but of course I don’t want to single any one out on here just for the moment but please keep all the wonderful pictures coming!! 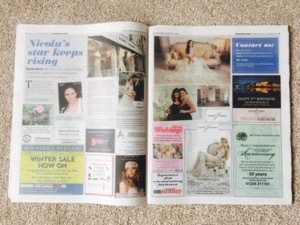 I can do a couple of posts as two of our lovely ladies, namely Jessica and Lizy were featured as real brides in the amazing Affinity Wedding Magazine and I can be a little bit cheeky and say I was delighted to also be featured as a real bride! Not only were we busy with lovely wedding fairs but many of the weekends were taken up with Designer Weekends. For those brides who are new to researching then it might be of interest to know that very often boutiques will have special trunk shows that showcase the designers that they stock in greater details. I have had Justin Alexander, Lillian West and Kenneth Winston designer weekends so far with more to come later in the year. At these events we are able to have the entire collection in store with the fantastic opportunity to purchase your dress with a discount of 10%. Of course this does mean you have to be quite confident when choosing but if you find your dream dress then it is a perfect opportunity to get it at a great price. Keep a lookout on the Facebook page for the Autumn events. 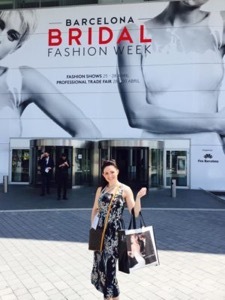 Now of course in order to provide all of my lovely brides with the latest stunning creations from the worlds top designers, I need to travel to go and do the buying for all of the new seasons collections. This is when the first part of the year is taken up with a lot of tough decision making. Many people ask me how I pick what I stock and I must say it can be tricky. There are hundreds upon hundreds of amazing gowns and it is a bit like being a kid in a candy shop. However, it is important to think carefully about what you want to provide for your brides. It is obviously wise to keep up with the latest trends but important to stay true to the tradition of bridal without also selfishly picking your favourites. If I had all the money in the world I would probably go even more wild but of course there are only so many that can be bought but fingers crossed you will all love the new dresses as they start to arrive in September. First up I was off to Madrid buying for La Sposa in February then it was on to the London Bridal Show in March buying from Kenneth Winston before jet setting out to Barcelona Bridal Fashion Week to buy from Justin Alexander and Lillian West in April and finally back to good ole blightly in May to buy my Suzanne Neville collection where I was thrilled to grab a picture with this amazing designer. You may have also noticed that her dresses have been featured frequently on many of the top celebrities recently and I am thrilled to be the exclusive area stockist. Although I must let you in to a secret, there is another very exciting new arrival on the horizon so keep a look out for the updates!! As I think many of you know I am so proud to be a local Bedford business and I love nothing more than collaborating with other local businesses and industry professionals. This year has been no exception and despite being rushed off my feet in the boutique I have always found time to help where I can. I provided a gown for a fab film organised by Beauty by Roxanne. You can find many of my top tips in Your Herts and Beds Wedding Magazine along with How to choose your wedding accessories in Find Your Dress. As a winner of the fab Four Counties Wedding Awards I was honoured to provide a dress for an incredible Cuban inspired photo shoot and delighted to have one of my gowns featured in Love Our Wedding. I am also not the only one to be celebrating an anniversary as The Vintage Suit Hire Company turned one and Greycourt Events also had their year celebrations along with 40 years as Greycourt Florists and I was also very happy to wish the Bedfordshire on Sunday a fabulous 40 years of providing great local news! Huge congratulations to all on your fabulous achievements and long may they continue. Finally to round off what has been a super six months I was delighted to win the Service Excellence and Bedford Business of the Year Awards at the first SME awards. I am thrilled to say I now move on to the National finals where the results will be announce in December at Wembley Stadium and I was tremendously honoured to be asked to be a spokesperson for the event. Once again it is at this point where I must thank all of my beautiful brides, industry colleagues, friends, husband and fabulous family for your continued love and support. None of this would be possible without you all and of course last but most certainly not least my inspiration Georgie boy! I have now reached my year anniversary at the new location and with my one year wedding anniversary approaching all that is left for me to announce is the last bit of exciting news and that is that I am now 5 months pregnant. We are obviously delighted and very happy to share our news but I want to reassure all of my lovely ladies that the boutique will all continue as per normal as my super assistants will be taking over where need be! Here’s to a bridal baby in the making!